The European Union (EU) funded housing project with a financial envelope of 14.7 Million Euro now in its second year of implementation, has made further progress this year. More than 215,000 people will benefit from this multi-faceted housing project, financed by the European Union, and implemented by Habitat for Humanity and World Vision Lanka. The project, which aims to bridge the gap between relief, rehabilitation and development, aims to facilitate access of returnees and host communities to affordable and appropriate incremental housing solutions, social infrastructure and livelihood protection. The ‘Homes not Houses Project’ is targeted to build 2,315 houses and repair 140 homes in 31 divisions across Batticaloa, Kilinochchi and Mullaitivu by May 2020. While 75% of the intervention is concentrated in the Northern Districts of Kilinochchi and Mullaitivu; 25% of the intervention is focused in Batticaloa in the Eastern Province. As of 30 June, 2018, 430 homes have been successfully constructed and more than 1,836 homes are currently in different phases of construction in all locations. The multi-year project includes the construction of conventional brick-and-mortar houses as well as homes that are built with appropriate construction materials such as Compressed Stabilized Earth Blocks (CSEB) and Earth Concrete Blocks (ECB). Building on the growing focus on sustainability, Habitat for Humanity has trained suppliers of materials and techniques which will not only result in the use of locally manufactured earth blocks and construction materials, but will also promote sustainable construction methods and reduce construction costs for homeowners, while creating employment opportunities for the local communities. Additionally, this European Union funded housing project has enabled Habitat for Humanity Sri Lanka to introduce innovative appropriate construction technologies such as the Fairface masonry technology, Ferro-cement –reinforced mortar and filler slab and Rat-trap bond. The Fairface masonry technique uses uniformly cast blocks with pointed mortar joints. It is both an eco-friendly and more cost-effective alternative to the regular process of plastering walls as it uses less sand and cement and provides a higher quality in appearance with pattern options and is more aesthetically pleasing in general. The Rat-trap bond method has proven to be a key construction techniques appropriate for the climatic conditions of the communities as the technique has improved thermal efficiency and reduces the amount of materials required. “I am encouraged to see the significant impact this housing project has made in assisting returnee families to achieve self-reliance and stability. This project has enabled Habitat for Humanity Sri Lanka in particular, to break new ground in the field of appropriate construction technologies by investing in earth-based technologies which are cost-effective and sustainable while boosting the local economy and providing much needed employment opportunities for the local communities. While there is still much to be done, I am proud of all that this project has been able to accomplish thus far. I am especially grateful for the funding from the European Union which enables Habitat for Humanity to assist these returnee families rebuild a sustainable future for themselves”. materials (compressed stabilized earth blocks and earth concrete blocks). create a place of business. 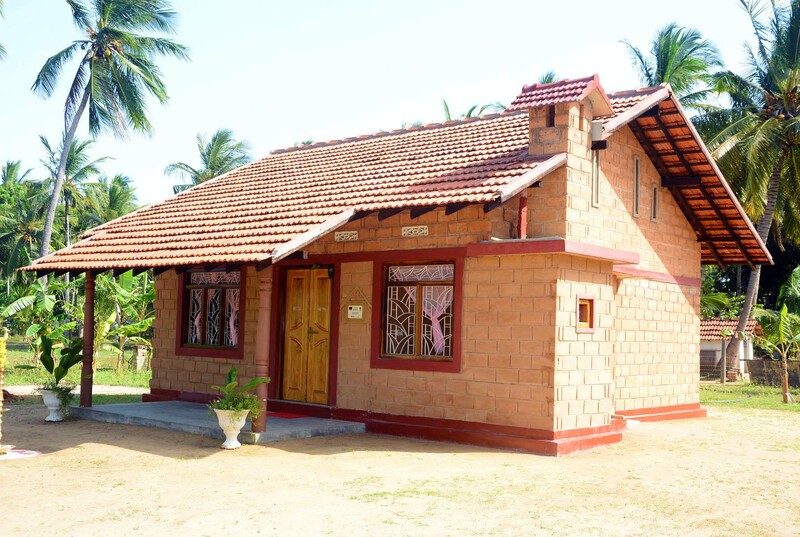 A completed house constructed through the use of appropriate technology and Earth Concrete Blocks (ECB) in Mullaitivu.Habitat Sri Lanka’s National Director ceremoniously hands over the first ECB house to the beneficiary family in Mullaitivu. 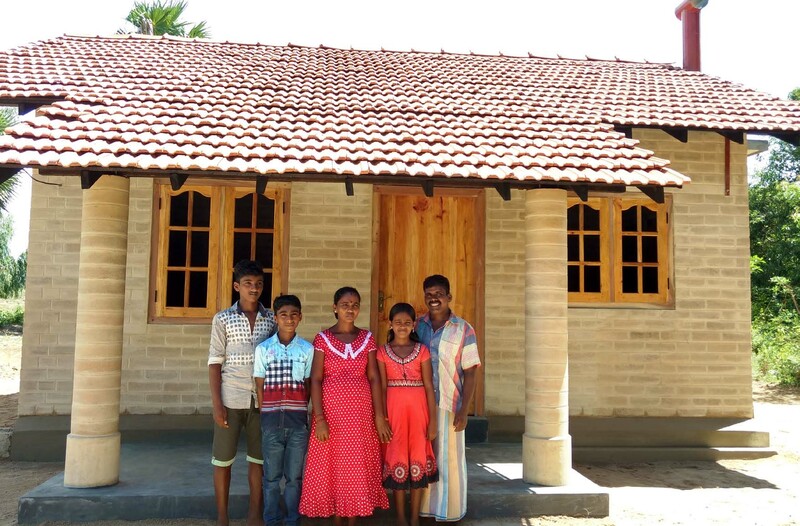 A first beneficiary family to receive a Habitat home constructed with the use of Compressed Stabilized Earth Blocks (CSEB) in Batticaloa. (Photo: Jim Kendell) CSEB bricks produced and ready to use for construction at the CSEB Production Yard located in Batticaloa.